BNZ Materials Marinite Insulating and Finishing Cements are air-setting materials, mixed with water and applied in plastic form. They are designed for application to irregular surfaces where it is impractical to cut and apply pipe, block or other insulating products. In addition to providing a pleasing, smooth surface appearance, BNZ cements fill voids and seal against heat losses. These strongly adhering insulations offer a hard surface which can be painted or weather-proofed if service temperatures are appropriate. For kiln and furnace refractory crowns and domes, and flat suspended arches. Insulation of small steel pipe fittings. For warped steel furnace shells prior to installing refractories. Finish coat over block insulation. For damaged block and pipe insulation. For areas in refractory backup insulation where other types of insulation would be difficult to apply. Mix with water and apply with trowel or shovel. Ideal for plant maintenance inventory to reduce number of items used for small jobs. Eliminate field cutting of block insulations for insulating irregular areas. An 1800°F service product, utilized in the refractory applications requiring a combination of insulating value and high temperature performance. A 1600°F product, provided in higher density than 508 Insulating Cement. 460 Cement can be applied in heavy layers. It is frequently used as the principal covering on pipe sizes smaller than 4″, then covered with a finish of 375 Finishing Cement. A one coat finish which hardens to a smooth, crack-free surface in a few hours. This surface may then be painted with a water-base paint. Recommended for insulating small steel pipe fittings and as a finish over nonabsorptive insulating surfaces or under very slowdrying conditions. Service temperature limit is 1400°F. 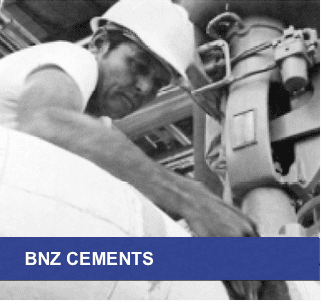 The physical and chemical properties of BNZ’s Insulating and Finishing Cements represent typical average values obtained in accordance with accepted test methods and are subject to normal manufacturing variations. They are supplied as a technical service and are subject to change without notice. BNZ Insulating and Finishing Cements can meet the requirements of the following specifications when specified on the order. Certificates of compliance can be provided if requested on the order also.